sailboat. : Mid Week Wishlist. 1. It's happened. I have finally caught on to the wonder that is Chanel make up. The packaging is gorgeous, the products look absolutely beautiful and the shades are always so classic and wearable. The Joues Contraste powder blush in Rose Initiale looks like the most perfect shade to give that beautiful pink flush to the cheeks. 2. Chanel Rouge Coco Shine Evasion lipstick has been on my wish list for such a long time, ever since I read somewhere that Adele wore it once and her make up always looks flawless. The perfect everyday wearable colour that will no doubt add a touch of luxury to my morning routine. I think I'll be asking for a couple of these for Christmas! 3. A simple black skirt is something that I am missing in my wardrobe, I've never been able to find the perfect one that's quite perfect but the Glamorous Black Swoosh Skirt looks wonderful! I love the gold belt detail and I always find Glamorous pieces to be such good quality! I would love to add this to my wardrobe! 4. This khaki and gold sequin coat from Lavish Alice is the coat of the moment I think. I'm not the biggest fan of khaki but when you add sleeves like that how can I resist?! I really love that it cinches in at the waist, it makes it look so flattering and super girlie. Ahh I love it! 5. The first time I went to look at the Revlon Just Bitten Kissable Balm Stains I wasn't overly impressed, but I have seen them being raved about by so many people I had to go back and have a look. The shade lovesick, a gorgeous bright pink colour has really caught my eye and I'm sure it'll only be a matter of time before I have to go and pick it up! 6. Another wish list, another SpiritHood. I know, I know. This is all getting a bit silly now but I absolutely adore them, they look so snuggly and warm! This is the Brown Husky Spirit Hood and I blame ASOS entirely for my lusting after it! 7. I'm not sure I'm quite edgy enough to properly pull off these Spiked Slippers from Tribeca Shoes, but I've been lusting over spiked shoes for such a long time! 8. Benefit will always be one of my favourite brands, I'll always be drawn to their super cute packaging and their little sets are always my favourite! The Feeling Dandy set has grabbed my attention, I've always wanted to try Posie Tint and the new glosses look lovely! I have your wish list post, It always inspired me. Chanel Rough coco shine is great. I have chance, and I love it!!! It's like a go to colour. I have it in my purse all the time. I have post about it. I love everything in this wishlist, especially numer 4 and 8!! 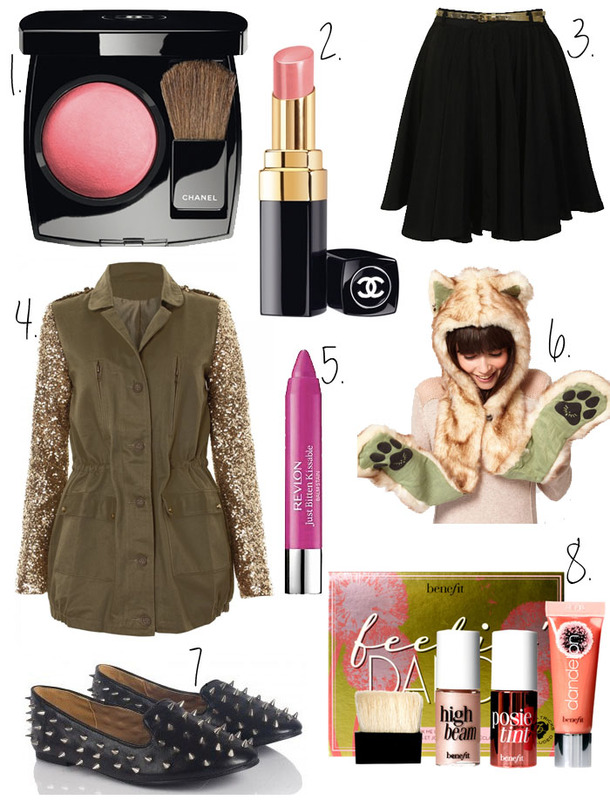 I sooo want that chanel blusher! Lovvve that pretty pearly pink colour! That blusher looks an amazing colour! Now added to my wishlist!